SIT 103 Zos Van Zindell - Victorious EP Part 2. Released on Monday 30th June 2014. 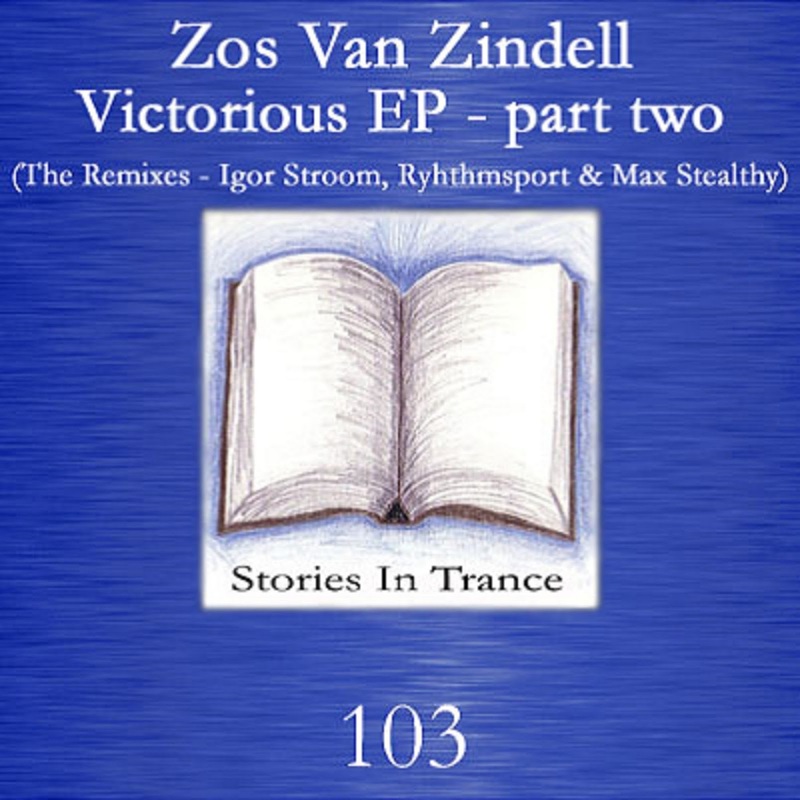 Stories In Trance present SIT 103 by Zos Van Zindell with the three track Victorious EP Part 2. After the release of the Victorious EP (SIT 101) we offer Part 2- the remix edition- which includes remixes of all three tracks from the original release by Igor Stroom, Rhythmsport and Max Stealthy. Up first we have the Igor Stroom remix of Victorious. Following on from his excellent remix of Triumvirate’s The Persistence Of Memory (Centenary Mixes) (SIT 100), Igor shows why he has become one of Eastern Europe's most notable producers. Perfectly using all the highlights of the original with his usual fantastic production technique he takes his remix down a more progressive route. With beautiful layering this is a stunning remix from Igor and a brilliant addition to his ever impressive catalogue of tracks and remixes. Sure to be a smash in any set or mix. The second remix comes in the shape of another debut on SIT from Rhythmsport AKA Alex Elenes with his version of Blue Water. Although a relative new arrival to the scene Alex has had appearances under his two aliases on labels such as 4Beat, Elliptical, Dub Tech, Somerhold, Vectiva and B-Sonic and it was his excellent track Nightfall on 4Beat earlier this year that brought him to our attention. He puts his own spin on the original and takes it down a more techy and aggressive route: a fine structure is perfectly complimented by an ever developing melody and superb mids and pads which all add up to a very accomplished and impressive remix. Alex is without question an exciting and very promising newcomer. To finish we have the last of the three remixes, and this one comes from Stories In Trance legend Max Stealthy. Fresh from his sensational remix of The Persistence Of Memory (SIT 100) Max once again delivers the goods. He uses all the melodic components against a punchy kick and driving mids to awesome effect, perfectly blending the atmospheric elements to add substance and depth to the mix it all comes together superbly in this top class production from one of our very favourite artists. In our humble opinion Max has become one of the very best producers in the scene as all of his productions show he has an abundance of imagination, creativity and talent, and that is why we are extremely proud to work with him. SIT 102 Konstantin Svilev - Terminal One. Released on Monday 23rd June 2014. 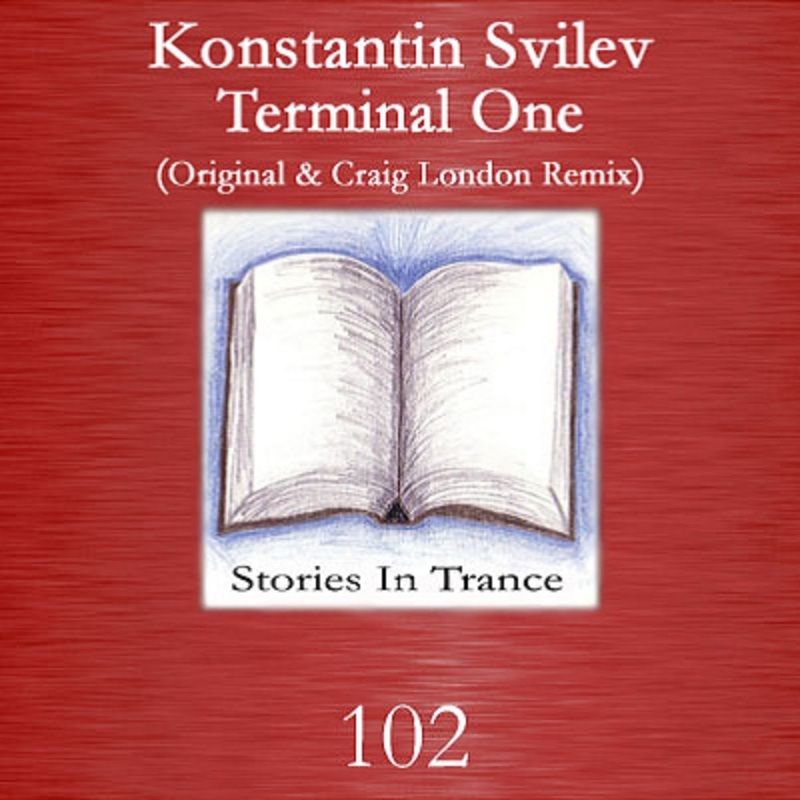 Stories In Trance happily present to you SIT #102 by Konstantin Svilev with the two track single Terminal One. Konstantin made his debut on Endeavour EP (SIT #51) with City and has since played a big part on our label with several fine tracks and remixes, although it's been a while since his last appearance- his rethink of D.Garton Productions Ignite (SIT #82). He is back at his best again with this energetic and ever progressing original. The great lead is backed with fantastic atmosphere, excellent mids and subtle yet unmistakable percussion which all add up to a wonderful track. This is a truly fine piece of work. Supporting the original is the Craig London remix. Craig's career to date has seen him make plenty of impressive appearances with us with some fine remixes and originals, most recently his massive track Bright Lights (SIT #97). Once again Craig is on top form showcasing his vast talents with this energetic and infectious remix that ebbs and flows with seamless transitions between the brilliant melody and driving mids and bass. Another top remix from a very talented producer. Released on Monday 16th June 2014. 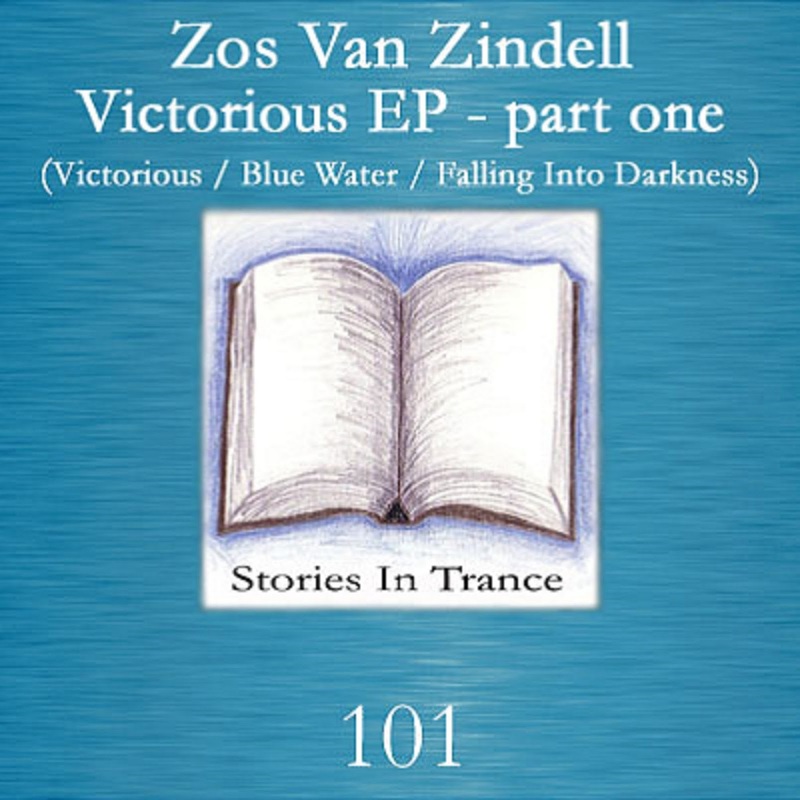 Stories In Trance move into our second century of releases and do so in fine style by giving you SIT 101; Zos Van Zindell’s three track Victorious EP- part one. It's time for yet another debut as we showcase our first Australian producer to add to our impressive global roster. Early in his production career to date Zos has made appearances on labels such as Phat Groove and For The Record and now arrives on SIT with a fantastic three track EP. Up first is the title track Victorious and it lives up to its a-side billing. Victorious is musically and melodically superb, engaging and captivating from the start. The brilliant lead melody is perfectly complimented by a subtle yet polished production technique which all add up to a real standout track. Next up is Blue Water and once again it follows a similar winning formula to Victorious: melodically driven by the defined lead and expertly backed with fabulous percussion and atmosphere. Blue Water is a beautifully warm and sophisticated original which illustrates Zos' musical creativity and talent. The final track on this fine EP is Falling Into Darkness. A shorter offering from Zos this track gets straight to the point with energy, drive and well crafted layering being the hallmarks of this awesome tune. This EP is a great way to start our second hundred and is a must have for proper trance fans and DJ's alike. Look out for more to come from the talented and imaginative Zos Van Zindell in the future on Stories In Trance. 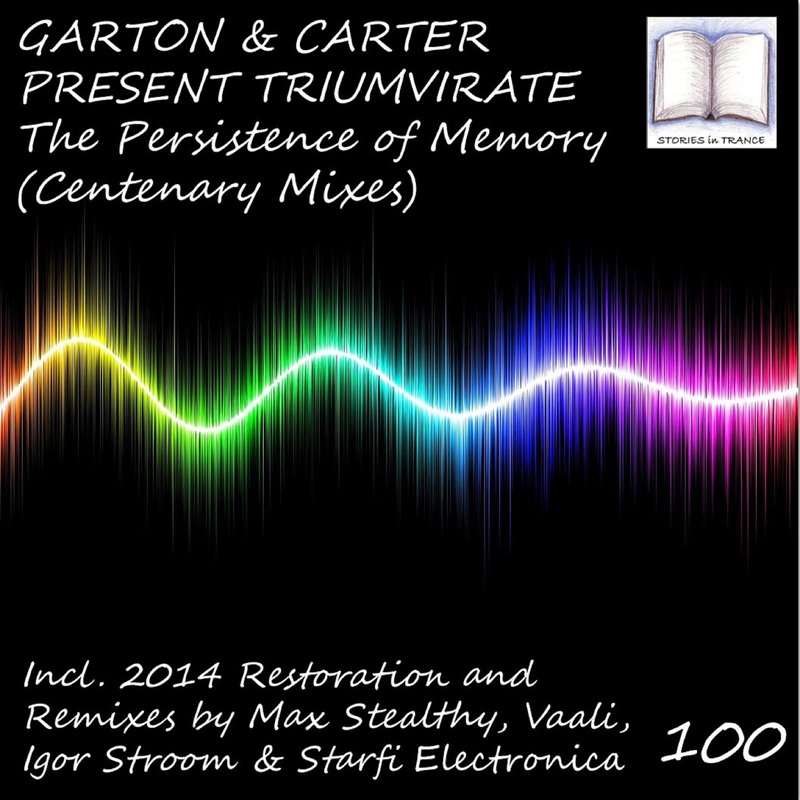 SIT 100 Garton & Carter Present Triumvirate - The Persistence Of Memory (Centenary Mixes). Released On Monday 9th June 2014. Stories In Trance are extremely proud to give to the world SIT #100 by Garton & Carter Present Triumvirate with the five track single The Persistence Of Memory - Centenary mixes. After over four years and 99 releases we reach our century in fine style, from SIT #1 by Airborne Angel with Apollo on June 28th 2010 we have featured tracks and remixes by 82 different artists from around the globe within all the best trance styles that the sound has to offer and with that ideal always in mind we reach our century by reprising SIT #60's The Persistence Of Memory. Up first we have the 2014 Restoration as Garton & Carter under their Triumvirate alias rework their first original production. Inspired by the older structure and style of trance, which was the reason we were drawn to the music in the late 1990's, we offer up something reminiscent of the good old days. Using state of the art studio equipment we have produced an old school power trancer. This time we make the track shorter and more potent by beefing up the bass and kick, adding some more driving percussive layering throughout and the addition of the beautiful Armenian instrument, the Duduk. The delightfully crafted lead melody is backed with sublime layering and a mesmeric break which culminates powerfully into something special. This is one for fans of everything that trance once was to savour and the perfect track for us to mark our 100th release. Next we have the first of four remixes, and this one comes from Stories In Trance legend Max Stealthy. Fresh from his sensational remix of Skywell’s Pressure (SIT #98) Max once again delivers the goods. He uses all the melodic components against a punchy kick and driving mids to awesome effect. This is a really top class production from one of our very favourite artists; an absolute must have for any and all trance enthusiasts. In third we give you the Vaali remix. Russian producer Vaali (Arthur Valiev) made his production debut with his fabulous track My City (SIT #81) and since then has backed that up with several excellent tracks and remixes- most recently offering up his double A-side Gladiator / Purple Blossom (SIT #96). In this short but truly superb remix Vaali makes every second count once again, as is now distinctive in his uplifting style. The immense lead melody is complimented with sensationally rich mids, underpinned with great effect by a deep driving kick making this an energetic and powerful track from a very creative and talented producer. Following on we have the Igor Stroom remix. Igor is no stranger to SIT although it has been a while since his last appearance - his excellent remix of We Love Trance (SIT #77), Igor shows why he has become one of Eastern Europe's most notable producers. Perfectly using all the highlights of the original with his usual fantastic production technique he takes his remix down a more techy route, once again this is a stunning remix from Igor and a brilliant addition to his ever impressive catalogue of tracks and remixes. Sure to be a smash in any set or mix. The final part of the 100th spectacular comes in the shape of yet another debut for Stories In Trance, this time from Starfi Electronica AKA Jason Mitchell. Under this alias he came to our attention with his awesome track Believe on AWJ Recordings earlier in 2014 and based on his production style we were very keen to work with him. There is no better way for this very talented artist to begin what is hopefully a long career with us than to finish off this truly special release in fine style. Taking the now unmistakable lead melody down a more progressive route this remix perfectly shows all his creativity and vision. A deep, rich and driving kick and bass added to the fantastic melodic components this is something very special indeed, a sophisticated and cultured piece of trance. So that is SIT #100. It has been a long and ever interesting journey with many twists and turns but in the end we have put out the tracks we wanted, in the way we wanted. Unique, diverse, bespoke and individual driven by our collective ideals and vision that has and always will be Stories In Trance! With thanks and gratitude to all that have helped and supported us along the way from all the SIT Team.